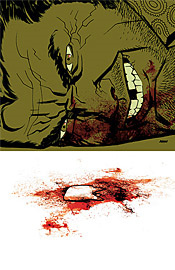 100 Bullets is nearing its conclusion, and for longtime collaborators Brian Azzarello and Eduardo Risso, that means it's time to stop setting up the dominos and sit back to watch them all fall down. What started as a simple premise (one gun, one hundred bullets, no questions asked) has slowly ballooned into a lengthy examination of who and what it takes behind the scenes to piece together such an arrangement. But while all of the major players may have been on the same side in the past, years of wheelings, dealings and quiet backstabbings have taken their toll. As the toy soldiers choose their sides, it's quickly become obvious that not everyone will survive to see how it all plays out. The series has spent so much time on introductions and backgrounds that it's a bit overwhelming to see it all coming to fruition. Its cast, a colorful arrangement of hitmen, madmen, businessmen and crime lords, has benefited from that slow pace and careful attention to detail. Azzarello has spent so much time and effort sculpting these personalities that the ship may be steering itself at this point. He need only provide the final destination, and the personalities he's populated the series with can take care of the rest. Having said that, I do think the series struggles with the size and depth of its cast. There are so many names and faces within these pages, some of whom we haven't seen in years, that it's become hard to keep track of whose allegiances lie where and who's still breathing. With the exception of a few key characters, I couldn't tell you the names that go along with half of these faces, let alone the details of their background, because it's been literally years since their stories were told. I've followed this series since issue number ten, and while it's remained astonishingly consistent throughout its run, (both in terms of artwork and writing) each month I'm left with the sneaking suspicion that I've missed something important. Azzarello constantly refers to minutiae that were last covered ages ago, and while that attention to detail is commendable, I've a hunch it's also lost on the vast majority of the book's readers. Maybe I should re-read the entire series before the big conclusion in issue 100. Series co-creator Eduardo Risso is still working the gears in the art department, and I wouldn't have it any other way. With the exception of issue 50, which featured a variety of guest artists, Risso has been with 100 Bullets every step of the way. His shadowy, noir-influenced style is as precise a match for this style of saga as I can imagine, and while his work has struggled ever so slightly under a recently increased workload, his familiarity with the cast more than makes up for it. When he's on his game, Risso is one of the top visual storytellers in the industry. Like Mike Mignola, he can speak volumes with a single line, while many of his contemporaries struggle to do the same with an abundance of painstaking details and complicated shading. Even when he's not at full strength, the personality and cinematic framing of Risso's work is worth the price of admission. If you're a new reader, looking to climb on board in time for the final episode, don't bother. This series isn't newb-friendly, and often isn't even accommodating to die-hards. Azzarello's dialog remains fascinatingly lifelike and he's taking some major risks with his series near its end, but complicated arcs and the sharp curves the current storyline is navigating make the book difficult to pick up and read. If you can catch up quickly and keep the finer points of the saga in your short-term memory, you might find this to be one of the best stories the medium has ever enjoyed. Otherwise, it merely comes off as a great atmosphere piece that doesn't always make a lot of sense. Borrow it and immerse yourself. The rewards are worth the risks.